That is the start of a comment to Mr. Sheldon Adelson from a group of purported Iranian hackers. He isn’t anymore popular with them than those who’ve enjoyed online poker. I guess the plus is he doesn’t hold back his views. 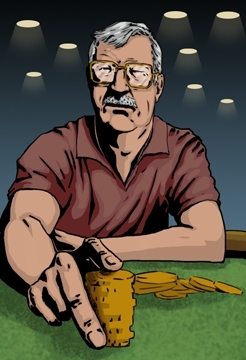 He hates online poker and is reported to have dumped a bunch reelecting the Senate Majority Leader Harry Ried when he was behind in the polls but only as a vehicle for promoting his online poker view because he is normally a staunch Republican. Adelson came to Vegas with ownership of the COMDEX show. As it became unimportant, he managed to trade it for the mediocre Sands casino which he had great success with and became a multibillionaire. A great business man and certainly a man with unique views. COMDEX is defunct and Sheldon got out just right. One of those controversial views is his suggestion to the President to nuke Iran. Most would consider that a bit outré. He seems a devout Zionist on most subjects. Poker players aren’t the only ones on his hit list. It is more likely that it was Iran and not poker players that recently reacted quite unfavorably to Mr. Adelson’s views. They nuked his servers as reported by BloombergBusiness Week. Maybe poker players should just consider a more measured response on their next LV visit. They might not want to play at a Las Vegas Sands property and help support the election of a online poker hating Republican — again an article from Bloomberg. Sands properties are The Venetian and The Palazzo. Also in the United States is the Sands Casino Resort Bethlehem, in Bethlehem, Pennsylvania. They are listed on the NYSE with the ticker LVS. Not at the top of my investment list as it will absorb 40-mil in repairs to the computer system. Looks like there isn’t a reasonable repair for Mr. Sheldon Adelson — who runs the joints. Adelson is the ultimate d-bag. His hypocrisy insults my intelligence. There is nothing worse than a man who has made millions (billions?) from others’ gambling, then takes the stance he does on online gambling. I played for a few hours at the Venetian while in Las Vegas. I felt dirty doing it.